Fancy yourself as a bit of a Marie Antoinette or Brigitte Bardot? Here’s how to add some classic French chic to your wedding day with fabulous flowers, Parisian glamour, and a French country-house vibe. When it comes to getting your wedding flowers delivery in, UK sourced flowers will be much cheaper than exotic foreign flowers. They also compliment the French chic theme much more, and lend themselves to vintage style. Think spring meadows, roses and Monet’s garden. Soft pinks, creams, pastels and pale green colours go well with the French theme, and teamed with some silk ribbon or gorgeous French lace, they will look spectacular. To accompany your classic, pastel flowers, there are a number of decorative themes then will add a French country-house atmosphere to your day. When it comes to table ware, think vintage crockery, understated glass vases and lanterns. White and pastels are also the colours to go for here. You can buy great value tea-sets and crockery from antique markets and second hand stalls. Go for traditional floral designs and white china. Vintage bird cages and lanterns are great ways to display your flowers and candles. They work beautifully as table centre-pieces and give an indoor space a fresh, outdoor feel. Add candles and fairy-lights for a magical effect. Reclaimed classic perfume bottles, jam jars and glass tea-light lanterns are cute ways to display table flowers. For additional accessories that will add fun to dining tables, why not buy in some vintage cameras for DIY wedding shots, and a couple of antique vanity cases full of Parisian themed accessories such as sunglasses and silk scarves. Vintage, classic wedding dresses will go perfectly with your French chic theme. 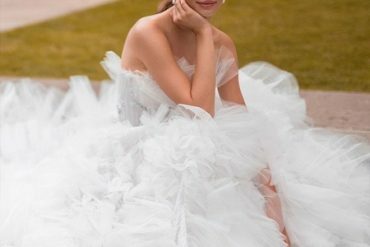 You can either go for a modern designer who takes classic dresses as inspiration, or buy through a dress company who source vintage dresses from around the world and tailor them to modern brides. Consider dresses that include lace detail on the bodice, sheer sleeves, silk buttons and a classic cut for that unmistakable French feel. If you can afford to go for handmade French lace- perfect! Once you have your dress, consider a headpiece that includes pearls and beading. Silver tones are best for this classic look and side tiaras have that elegant twenties feel. Pearls are also the way to go with earrings and jewellery, and can easily be tied in with your ‘something old’ item. The French are renowned for their decedent pastries and handmade chocolate. A display of tasty French treats on vintage china will look fabulous and taste even better. Contact French patisseries in your local area and see if they can cater for weddings. Vintage sweet jars full of bonbons and lolly pops also add a fun twist to the French theme, and will go down a treat with the kids at your wedding. Buying in some traditional French children’s games will also provide much needed entertainment for little ones, and give your wedding a distinct ‘garden party’ feel.